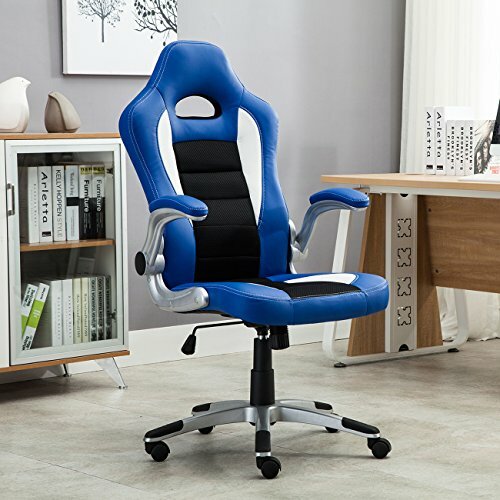 Racing style High Back Office Chairs with a unique appearance and feel. Unlike regulator office chairs, this chairs features Bucket Seats for extra comfort on those long working days and it has an extremely comfortable back that molds around and supports your back. Chair designed in a way that allows modification to accommodate individual requirements of different office users by giving additional features of Flip-up arm rest which makes the user more comfortable during work hours. Smooth gliding casters provide increased comfort and mobility, also easy gliding over any floor surface. Seat Dimension: 20" x 20"
360 degree swivel rotation with Dual Wheel -Casters for easy Gliding over any floor surface. Ergonomically enhanced for lumbar support and individual positioning at any keyboard or desk with pneumatic height, tilt lock and tension control adjustments.